This research project is part of the Delft Global Initiative program: the portal and booster of Science and Technology for Global Development at TU Delft. Aim of the program is to contribute to sustainable solutions for global societal challenges, through problem-oriented interdisciplinary technical research in close cooperation with partners in the developing world, to meaningfully improve lives of people living in poverty. Combining modern advances in smartphone technology with the seemingly unlimited possibilities of 3D-printing, in this project we aim to create easy access to prosthetics for amputees in Third World countries. We will develop an advanced, free IOS / Android app that scans the amputee with a smartphone camera and completely automates the complex prosthetic design process ending in design drawings for a 3D-printer that manufactures a well-fitting prostheses. In this project we will not only generate new, fundamental knowledge on automatic designing and manufacturing, we will also collaborate with a number of charity organizations to stimulate local initiatives in 3D printing and to optimize the prosthetic supply chain. 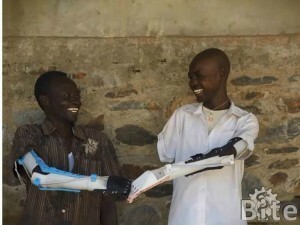 Photo: Example of 3D-printed prostheses from Mich Ebelings “Not Impossible Project” in Sudan.